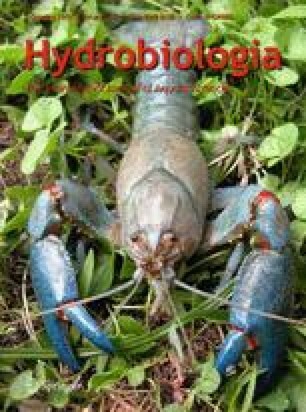 We examined the effect of magnesium (Mg) on the charophytes calcite (CaCO3) encrustation and assessed whether charophytes, growing on non-calcareous sediments in the Myall Lake, a poorly flushed shallow coastal lake with salinity of 2–3 PSU, could function as an effective nutrient sink for phosphorus (P) in a similar manner to charophytes growing on calcareous sediments of the freshwater calcium (Ca)-rich hardwater, i.e., through the formation of Ca-bound P. Our results showed that high Mg in the Myall Lake water reduced the calcification in charophytes. Likewise, the addition of Mg into the tap water also produced the same effect. The inhibition of the calcite formation decreased significantly the percentage of Ca-bound P formation in the charophyte biomass as well as in the sediment. However, the inability of charophytes in Myall Lake to precipitate calcite does not reduce the plant beds' capability to act as a P nutrient sink. Instead of Ca-bound P, a large percentage of less bioavailable non-reactive organically bound P (NaOH–P: 40–65%) fraction in the biomass, together with the plant’s slow decomposition rate, will lead to burial of dead organic matter and an incomplete mineralization process. In particular, detritus of the charophyte plants’ thalli is relatively more resistant to mineralization. This mechanism was supported by the result of sedimentary P fractionation in which the refractory P and non-reactive organic P fractions accounted for at least 80% of the total P.
The earlier version of this manuscript was presented and published in the proceeding of the 12th World Lake Conference, TAAL 2007, Jaipur, India. This study was supported in part by a Grant-in-Aid from the Ministry of Education, Culture, Sports, Science and Technology of Japan and the Japan Society for the Promotion of Science. We thank the anonymous reviewer for the comment on the earlier version of the manuscript. We also would like to thank Takeshi Fujino, Jagath Manatunge, Lalith Rajapakse, Daniel Shilla, Brian Sonderson, and Anna Redden for their assistance during the field sampling. Gustafsson, J. P., 2007. Visual MINTEQ ver. 2.53. Department of Land and Water Resources Engineering, Royal Institute of Technology, Stockholm, Sweden. http://hem.bredband.net/b108693.